Special thanks to Antonio Lao for helping me out on this issue. Best customer support ever! Very responsive. FORCED HSS causes 3 second delay from shutter to flash on the RF60. Run LEARN HSS. Shoot at 1/1000 as instructed. Toggle the scroll bar to turn FORCED HSS to ON. There should not be a delay with the RF60 when you push the shutter and when the flash triggers. If you notice a delay, turn off the FORCED HSS and check for duration of delay. If you notice that there is a delay, simply reinstall the firmware of your RF60. I found this issue out after trying out my other 2 RF60s. Of the 3, only 1 had a delay from shutter to flash trigger. Hope this helps you out! Thanks again Antonio for the assist. Hi do we still need to do LEARN HSS even if we're using a V6II and RF60? I thought we only need to do it for other brand flashes. I have a Fuji X-T10, V6II and RF60 and it fired in HSS straight away although sometimes at 1/4000 there's a bit of black bar at the bottom, as you take a shot sometimes it shows black and sometimes it's clean. I just wanted to chime in here that I have also had this issue and figured out how to solve it. Using the V6II on a Fuji X-Pro 2 with RF60s, there would be a delay of around a second between hitting the shutter release and the RF60 triggering when using FORCED HSS, even after going through the learn HSS process. Through a bitter, bitter process of trial and elimination I discovered that the V6II has to have firmware V1.1.001 for this combo to work correctly (not V1.1.002 or V1.1.003) and that the RF60s have to have either firmware 201, 202 or 203 installed. @jarce, thanks for the kind words and I am glad you got it working! LEARN HSS is only for Fujifilm cameras. And you gotta do this for different Fujifilm models because each has a slightly different timing. Thanks for chiming in and I am sorry for the bitterness of trial and error. However I don't recommend using 1.1.001 as it is quite buggy. On 1.1.003, with proper hot shoe connection between camera and TX unit and Learn HSS done, Forced HSS should not be a problem. Please hit back if you are still having troubles with your setup. I've just come back to use these triggers and flashes and I'm pounding the desk in frustration. Same set up, Xpro2, V6II and RF-60s. The trigger will only auto detect it is on a Fuji camera about one time in ten, properly work in HSS without bars one time in twenty and freezes autofocus on the camera about half the time. I've updated the firmware on everything to the latest version, followed the instructions in this thread and elsewhere and no dice. What am I doing wrong here or should I just return it for a refund? ... followed the instructions in this thread and elsewhere and no dice. Does that includes removing the hot shoe metal spring plate on your X-Pro2? Because I can auto-detect a Fujifilm X-T1, X-T2, X-E1... every single time, 100%! ... and freezes autofocus on the camera about half the time. This is a first. I wonder if this happens even if the camera is correctly detected? Too bad we don't have an X-Pro2 with us to test. We only have the X-Pro1. But we haven't experienced such an issue before. I´ve the same problem as Josh describe. I even bought a new RF60 because I thought it would solve my issues. But it didn´t. I can fire the flash with FORCED HSS on OFF but it doesn´t work with FORCED HSS on ON. I´m about to give up and sell my transcievers and flash. I´ve done all, all of the above as Jarce describe. Did you let V6 II to auto-detect? Removed the metal spring plate? I´ve done all that, Antonio. Several time. I´ve the X-pro2. Recently I got the x-t2 but I haven´t tried it. I read many threads where most photographers actually got this to work. But not me. I´ve tried everything even bought new flashes, but still nothing. Soon I will be without any hair on my head. If I were you, I'd report the firmware versions that Antonio from Cactus has requested. With the Cactus devices, some people make the mistake to believe that pressing "Update" in the Firmware Updater automatically upgrades the firmware to the latest version. It does not. One has to first select the firmware with the button above "Update" that one wants to use for updating the device. It is a good idea anyhow, to double-check the firmware versions. V1.1.005 is the latest for the V6II and V2.04 is the latest for the RF60, IIRC. ...It is a good idea anyhow, to double-check the firmware versions. V1.1.005 is the latest for the V6II and V2.04 is the latest for the RF60, IIRC. Yes, 2.04 is the latest version, your recall is indeed correct, Class A.
I have download the latest firmware for V6ii and RF60 and installed them. But the result is the same, doesn´t work. I´ve really tried everything and, as I wrote before, even bought a Cactus RF60 which I thought should solve my problem. But it didn´t. Status quo. But I don´t get the same result. Puh. You wrote, and I quote, "Yes, 2.04 is the latest version, your recall is indeed correct..." which is for PC. Is there any difference between these perhaps. I know it wouldn´t but I would try everything right now. The version number there is the version of the Updater software, not the firmware for the triggers. The Updater downloads the latest firmware from Cactus, so you don't have to install a new version of the Mac/PC updater software every time there is a new firmware update. Ignore the difference in version numbers between Mac and PC - the actual firmware that both can download and install into the triggers is the same. OK. I´ve got it to work all of a sudden. I checked all my firmware and i hadn´t got the latest update for the V6 ii which I thougt I had. Call me ailly. it´s OK. But still it doesn´t support all my flashes. Cactus RF60 (with updated firmware ) I can´t get to work. My old Canon 550EX and 430EXii + Yongnuo 568EXii works but not the Yongnuo 600EX RT. There you go. Thanks for all your support. Now I can go out and shoot some HSS shots at last. But I wish me my more powerful flashes would work to. @petada, so with your V6 II running on 1.1.005 and RF60 on 2.04, you still cannot get RF60 to do HSS on your Fujifilm? Did it frie at all? Or a delayed flash? 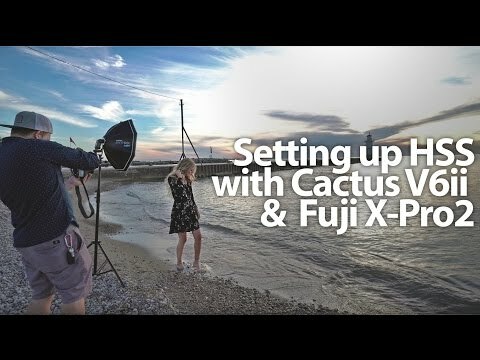 Did the RF60 not work but other Canon flashes mounted on V6 II RX worked? If you press "Next" on the RF60 while you turn it on, what does the display show? Do you have the RF60 set to "S" (slave) mode? Do you have the "AU HSS" option set to "ON"? Just keep going through the menu items until you see it. Make sure that there is no "Delay" value set. Also, try to be more specific what works and what does not work. Can you change the power levels on the RF60 using the V6II? First, thank you for your fast support and your eager to help out. Finally I got it to work. The problem was that the V6ii was to close to the RF60. When I put the RF60 two meters from the V6ii, it suddenly work. And all works just fine now and I´m happy with it. Thank you for your support. All of what you describe I´ve done. See my answer to Antonio. Great and thanks for the update @petada. If you need to place your flash close to the camera / V6 II TX, be sure to set the Work Range to SHORT. Menu > Radio Setup > Work Range > SHORT. In case I use one flash on top of V6 II hitself on top of camera's hot shoe and other RF60 remote flash(s), what is the max distance to place my remote flash(s) if I want HSS to work (which means setting Work Range to SHORT) ? It depends on your surroundings - indoor / outdoor / nearby RF activity (such as WiFi devices, etc), but we have tested on an open field Short range maxed out at around 100m. But why did you mention your on-camera flash? It should not matter if you have one or not as the RF transmission has nothing to do with the on-camera flash. You plan to use V6 II to trigger RF60 to achieve HSS, right?